There was a "meditation of the day" in Magnificat recently that caught the attention of some people (including me). 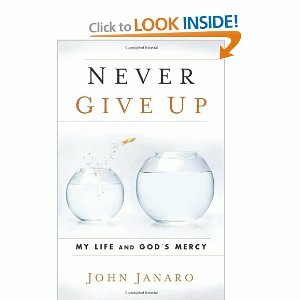 It was taken from the introduction to my book Never Give Up: My Life and God's Mercy. Of course I was very happy to see this, above all because I know there is a wide audience that could benefit from my book, and that has yet to be reached. It may also encourage those who have the book to read it, or finish reading it, or maybe read it again. Or talk about it with a friend or loved one. One thing I know about my book is that it has touched the hearts of a variety of people, with many different kinds of struggles and difficulties. It's not just for "sick" people. So please check out this link (http://t.co/ddwYeqX) or refer others to it. I am convinced that the sufferings of my family in these recent years are nothing more than the lot of multitudes of people throughout our world. They, too, love and struggle and seek the face of God. We must never lose our trust in God. Even when life is a black abyss, we must have faith, because God has promised, 'I am with you' (Is 43: 5; Mt 28: 20; see Ps 23: 4). The road is often narrow and dark, but God is our shepherd. He is by our side, even when we feel very much like wounded sheep. When we walk "through the valley of the shadow death" (Ps 23: 4), we must not give in to the bug of anxiety that would bite us at every turn. 'The valley of the shadow' is a long way from paradise. And yet God is with us. We must hold close to him in faith, a faith that comes through the breath of love, however faint that breath may seem. Guest Blogger: A Five Year Old! It's Not Enough! I Want More! Everybody's Got a "Flip Side"
The Movie Massacre: How Does It Affect Us?